Roast beef with Yorkshire puddings is recognized across the world as a traditional British dish, but the history of the Yorkshire pudding is shrouded in mystery and its origins are virtually unknown. There are no cave drawings, hieroglyphics, and so far, no one has unearthed a Roman Yorkshire pudding dish buried beneath the streets of York. The puddings may have been brought to the shores by any of the invading armies across the centuries, but unfortunately, any evidence of this has yet to be discovered. What has been found, though, are recipes, including one dating back to the early 1700s. Overall, they are similar in the most basic sense, but there are a few interesting differences. The first ever recorded recipe appeared in a book called The Whole Duty of a Woman in 1737 and was listed as "A Dripping Pudding." The dripping comes from spit-roast meat. The recipe reads: "Make a good batter as for pancakes; put in a hot toss-pan over the fire with a bit of butter to fry the bottom a little then put the pan and butter under a shoulder of mutton, instead of a dripping pan. Frequently shake it by the handle and it will be light and savory, and fit to take up when your mutton is enough; then turn it into a dish and serve it hot." The next recorded recipe took the strange pudding from a local delicacy to Britain's favorite dish. It appeared in The Art of Cookery Made Plain and Easy by Hannah Glasse in 1747. As Glasse was one of the most famous food writers of the time, the popularity of the book spread the word of the Yorkshire pudding. "It is an exceeding good pudding, the gravy of the meat eats well with it," states Glasse. A somewhat different instruction in her recipe is "to set your stew-pan on it under your meat, and let the dripping drop on the pudding and the heat of the fire come to it, to make it of a fine brown." Mrs. Beeton may have been Britain's most famous food writer of the 19th century, but her 1866 recipe omitted one of the fundamental rules for making Yorkshire pudding: the need for the hottest oven possible. The recipe was also erroneous by instructing the cook to start baking the pudding for an hour before placing it under the meat. Yorkshire folk blame her error on her southern origins. The Yorkshire pudding survived the wars, the food rationing of the 40s and 50s, and sailed through the swinging 60s. As the pace of modern life picked up and more women worked outside of the home, cooking in the home started to decline. 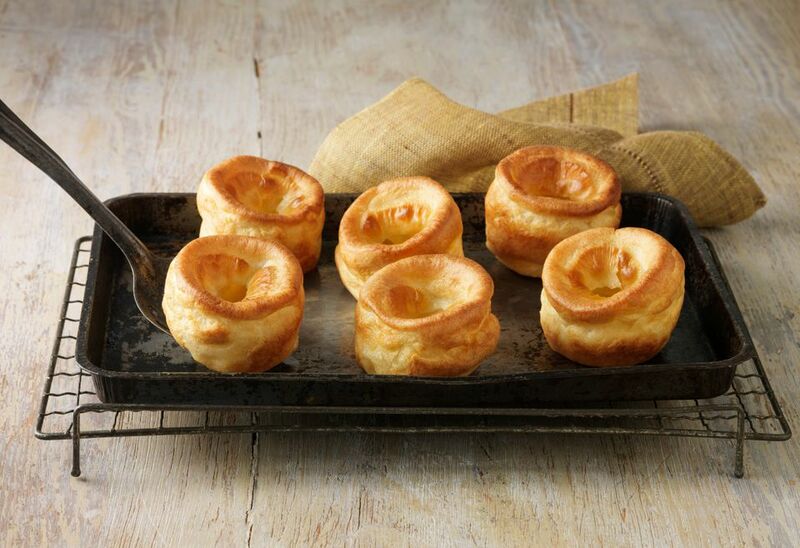 The rise of convenience foods and ready-made meals toward the end of the last century saw the invention of the first commercially produced Yorkshire puddings with the launch of the Yorkshire-based Aunt Bessie's brand in 1995. In 2007, Vale of York MP Anne McIntosh campaigned for Yorkshire puddings to be given the same protected status as French champagne or Greek feta cheese. "The people of Yorkshire are rightly and fiercely proud of the Yorkshire pudding," she said. "It is something which has been cherished and perfected for centuries in Yorkshire." At the time, Yorkshire pudding was deemed too generic a term, but that hasn't stopped Aunt Bessie's and two other pudding manufacturers (with the support of the Regional Food Group for Yorkshire and Humber) from making another attempt for the protected status. Understandably, this has caused concern for everyone outside of Yorkshire who makes the puddings commercially since they might have to rename their products Yorkshire-style puddings. Today, the Yorkshire pudding is as popular as ever, whether home-cooked, eaten at the thousands of restaurants across the UK serving a traditional Sunday lunch, or bought from the supermarket. On a Sunday, ex-pats and Brits throughout Europe tuck into Yorkshire pudding, and in Australia, New Zealand, and Canada puddings are still a large part of the food culture. Just why this simple mixture of flour, eggs, milk, and salt gained a place in the culinary hearts of a nation and developed a worldwide reputation is a mystery which many have tried to solve but have yet to find the answer. Maybe it is simply because Yorkshire puddings taste so good!